Day 5: We bird the Wangdi/Phunakha area for a full day for White-bellied Heron and a host of forest birds. Day 20: into India for departure from Guwahati airport OR optional north-east India EXTENSION. 20-day tour: Between March / April & Oct / Nov.
Join us for 3 weeks every March/April & Oct/Nov. 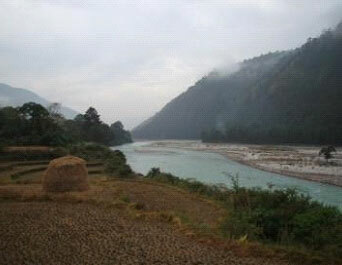 as we look for the special birds and other wildlife restricted to the magnificent eastern Himalayas. Bhutan is arguably the best country ever for finding these Himalayan birds because well over half the country is still covered in pristine forest. On our last tour, we found a host of tantalizing birds, including the likes of Himalayan Monal, Satyr Tragopan, Beautiful Nuthatch, Ward’s Trogon, White-bellied Heron, Ibisbill, Black-necked Crane, Rufous-necked Hornbill, Rufous-bellied Eagle, Fire-tailed Myzornis, Wallcreeper, Black-eared Shrike-babbler and Yellow-rumped Honeyguide. 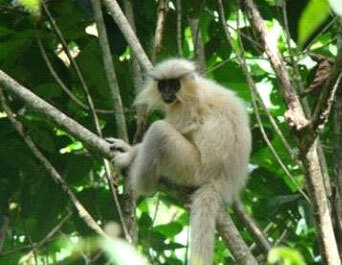 Good mammals on our last trip included Leopard Cat, Black Giant Squirrel, Golden Langur, Yellow-throated Martin and Yak. We timed our trip in March/April because this is one of the most beautiful times to be in the country, with spectacular shows of blooming rhododendrons and other flowers, spring weather and lots of birdsong. With luck, at this time of the year we might also find Black-necked Crane, if it hasn’t yet departed for Tibet. In addition to wildlife, the scenery during this tour is absolutely spectacular, with sights of grandiose snow-capped Himalayan peaks, green hillsides and stunning architecture. During our birding, we also make a little time available to visit the inside of a Dzong, to look at Tiger’s Nest Monastery precariously-positioned on a ledge high up on a cliff – and you will also be able to ask our knowledgeable local guide about the culture and history of this peaceful and quaint land. We start the tour in the remarkable high-altitude town of Paro, where your international flight will arrive. We sample stunning mountain passes reaching 4000 m (13 000 feet), beautiful fast-flowing rivers and wonderful forests that cover vast tracts of the countryside, as we gradually travel eastwards through the country, birding almost constantly along the way. The tropical lowlands around Zhemgang are always a highlight, generating Golden Langur, Beautiful Nuthatch and other incredibly localized and sought-after animals and birds. We also bird the famed Lingmethang Road and a host of other incredible sites before eventually exiting Bhutan and flying home from Guwahati Airport in India. We also offer optional extensions looking for 1) Red Panda within Bhutan and 2) One-horned Rhinoceros and the very rich diversity of lowland plains and wetland birds in adjacent India (before departing from Guwahati). 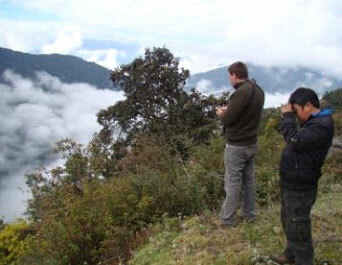 Please e-mail kargyel@druknet.bt for any questions about upcoming birding tours. For trip report, please click HERE. The rare White-bellied Heron, stunning White-capped Water-Redstart and other water-associated birds are found along the Himalayan rivers. We do most of our forest birding from the road’s edge – Bhutan has a great network of good roads that allow easy forest birding from the extreme west where we start this tour to the extreme east.